Do you find the idea of Santa to be fantastic? Then you might discover Real Time Gaming’s Santastic slot online to be very captivating. It is rich in festive cheer and extends a lot of gifts to players who are carried away by the Christmas spirit. 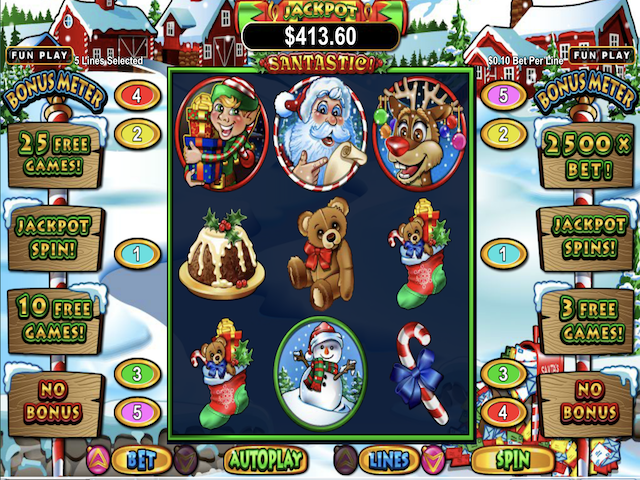 Santastic slot lets you win all types of prizes for finding various Christmas-themed items like the North Pole, Rudolph, Elves, snowmen, Christmas puddings, stockings, and Santa himself. In addition, the game has unique Double, Triple Wild Symbols that can double, triple or even multiply your prizes six times if they combine. In addition, Santastic slot has Jackpot Spins, a Festive Feast Feature, and a Jackpot. Also, spin-stakes are not scary at all since the choice from 0.25 to 1.25 coins. In this game, you are just required to help Santa convey his goods to a beautiful snow-filled village that has lovely redwood houses alongside snow-capped mountains. Actually, you can see it snowing when you spin the 3×3 reel grid that provides players 5 pay-lines that they can try and line up as many as three-of-a-kind winning combinations. To begin building your festive fortune, you can spin in matching symbols with 5 coins for 3 teddies or candy canes, 7 coins for puddings and stockings, 10 coins for snowmen, 20 coins for the North Pole, 30 coins for Elves, 50 coins for Rudolph, and 100 coins for Santa. Nevertheless, making those lines up with a double wild double your prize while a wild triple, triples your prize. On the other hand, a combination of both the double wild and the triple wild multiplies your prize 6 times. If you spin in 3 jackpot symbols in a line that has already been played, you can win the jackpot on the spot. However, you spin in a jackpot symbol on the center reel; it will hold while the other positions spin as they try to reveal the other jackpot symbols. Any three-of-a-kind win can trigger the Festive Feat Feature that hosts a plethora of enjoyable festivities. Each side of the reel grid has a Bonus Meter that can award extra Jackpot Spins. Even Santa’s handpicked gifts can come in small packages, the reason why the Santastic spin exists. Santastic slot online has highly enjoyable 5 pay-lines that cover the reels, and you can stake each line for 0.05 to 0.25 coins, which means that the spin-takes range is only between 0.25 and 1.25 coins. Although the combination of Santa and fantastic sounds like a big joke, it is agreeably a Christmas cracker.